Sometimes families reach impasses that prevent them from resolving coparenting challenges. Coparenting consultation sessions provide a respectful environment for both parents to share their concerns and develop a written plan of action. The licensed mental health professional is able to provide recommendations and relevant information in order to assist in the formulation of a plan in the best interest of children. 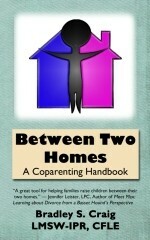 This is a form of alternative dispute resolution using co-parenting focused education to aid in communication between parents to promote settlement of disputes and better understanding of coparenting issues. This process assists in designing a coparenting plan that outlines current and future details regarding how you are going to raise your child between their two homes. The contract for confidential coparenting consultation services for voluntary or court ordered confidential services or the contract for non-confidential coparenting consultation services for court ordered services. Please deliver each form separately via .pdf scan to brad@childreninthemiddle.com or fax (972) 704-2912. Once all the forms are fully completed and on file by both parents, an initial appointment letter will be sent to the parents to schedule the initial joint appointment. Because of the nature of court connected cases, it is important for us to maintain a written paper trail so phone calls will not be returned. If you have questions, please send questions in e-mail. Rates are $150.00 per hour (not per person). If you are court ordered, please send a copy of your order. Please plan on at least a three hour initial meeting.We have found that families that have attended coparenting education or read Between Two Homes have a greater success rate, better follow-through, feel more empowered, and utilize their time more effectively. Completion of the live Children in the Middle Co-parenting class or online Making Two Homes Work class is strongly recommended prior to the first session, and is required if you are court ordered to this service. For information on designing a plan, please click here.